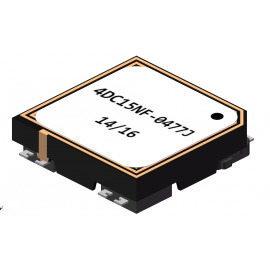 The new 4Dcoil Series, provides three orthogonal coils for working at low frequency (standard 125 kHz) and an additional coil for working at high frequency (standard 13,56 MHz).With very stable properties in a wide range of temperature (-40ºC to +85ºC). Its efcient design of low frequency coils has very high sensitivity and excellent isotropy. The inductance value is 4.77mH @125kHz (other values under request). Inductance value of high frequency (NFC) antenna is 0.85uH @13.56MHz. Can be used in RFID applications with ISO15693 (vicinity: I-Code), ISO 14443A&B (proximity: MIFARE) interface, ISO 18092 and Felica. Suitable for Pick&Place SMD assembly- Taped & Reeled.